Counting on fingers–how do you stop it? These are exactly the right questions. Rocket Math is designed specifically to prevent these problems. First of all, Rocket Math Daily One-Minute timings are composed entirely of problems the students do know, so they don’t need to “skip problems you don’t know.” In fact, in the daily one-minute tests if students skip any problems they are counted as wrong, because it is evidence that they don’t know it. You can see the sequence in which multiplication facts are learned here. Set A in Multiplication, for example, it is composed entirely of 1 x numbers in which the answer is the number. There’s no need to finger count. There’s no need to skip around. Each set then only adds two facts and their reverses at most. Set B in Multiplication only adds 2×2, 2×3, and 3×2 to those ones facts. So by the time the student finishes practicing, even the first day, he/she should be able to answer all the facts on that day’s One Minute Timing without having to skip count on his/her fingers. The other part of the equation in Rocket Math is that we set the goal individually for each student based on the Writing Speed Test. We set their goal as fast as their little fingers can carry them! There is no time to stop and count on fingers or stop writing answers to look for problems they like better. So students will NOT pass if they are doing any of those things. Of course, it’s up to you as the teacher to warn students ahead of time, “There is not enough time to take breaks, erase answers, or count on your fingers. If you do those things you won’t pass!” And of course, students are very motivated to pass levels and move up the Rocket Chart. Why a test of writing speed? Question: What is the purpose of this writing speed test exactly? Should a child be held back from progressing through the levels simply because they have not passed the writing speed test, especially when they already know their math facts? Can you please clarify? Answer: The purpose of the writing speed test is to make sure that students are not asked to write answers to math facts at a rate faster than they are able to write. The purpose is not to hold children back who know the facts—exactly the opposite. The test is to make sure their goals are appropriate and that they are not held back by their writing speed. There is also an explanation under Letter “i” in our FAQs. It is also covered in the complete Teachers Directions–free to download. Not all teachers have these directions—so feel free to share them. For less than fluent writers their goal is to write as many answers as they can write in one minute. See the information about the Writing Speed Test for details of how their goal would be adjusted down from 40 problems per minute. Their goal will be to answer as fast as their little fingers can write! We do not want children to be hesitant, or have to stop to figure out math facts. We want them automatic, with as little thought required as possible. We definitely do not want them counting on their fingers. Allow us to repeat ourselves here… NO FINGER COUNTING! Why do I have to give a writing speed test? We have found that many children are not able to write the answers to 40 problems in one minute. They can orally say the answers to that many problems, but they can’t write that fast. In grades one and two it may be nothing more than an “inexperienced little hands” problem. In other grades handwriting speed is dependent on other variables. When they learn their facts, but cannot pass a test, due to slow writing, we see much weeping, gnashing of teeth and pulling of hair. (And that’s just the teacher.) Suffice it to say, it’s not a pretty sight. So we want to establish goals for all students that are no faster than they can write. To do that we have to find out how fast they can write. That’s why we have to give the Writing Speed Test. How do I give the Writing Speed Test? The Writing Speed Test is pictured above. The children are going to write in each box the number they see up in the corner of the box. They look at the number and write it. That’s just how fast they should be with the math facts—just look at the fact and write the answer without hesitation. However many boxes they can write the numbers for in one minute, determines the number of problems they can be expected to write the answers for in one minute. This sets their goal. When you give the test, make sure all students are situated with their papers out, names on them and their pencil at the ready. Tell students to hold their pencil up (yes, in the air!) when they are ready. [This is a really cool technique to use for all timings. If students are holding their pencils at the ready and in the air, nobody can be cheating by starting early. Also, in this way you can look out over the masses and easily tell when everyone is set and ready to go.] 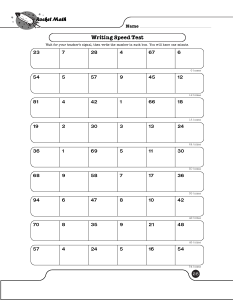 The directions for the Writing Speed Test are on the test sheet. Read these aloud. Do not allow any students to start ahead of time as this will invalidate their score. Have the students write in the boxes as fast as they can for one minute. Then they can put the tests back into their folders, and turn in their folders. You will be taking the information from the test and putting it onto the goal sheet. How do I set up Rocket Math? Begin with a file crate. Go to the Subscription site for the operation you will teach first. 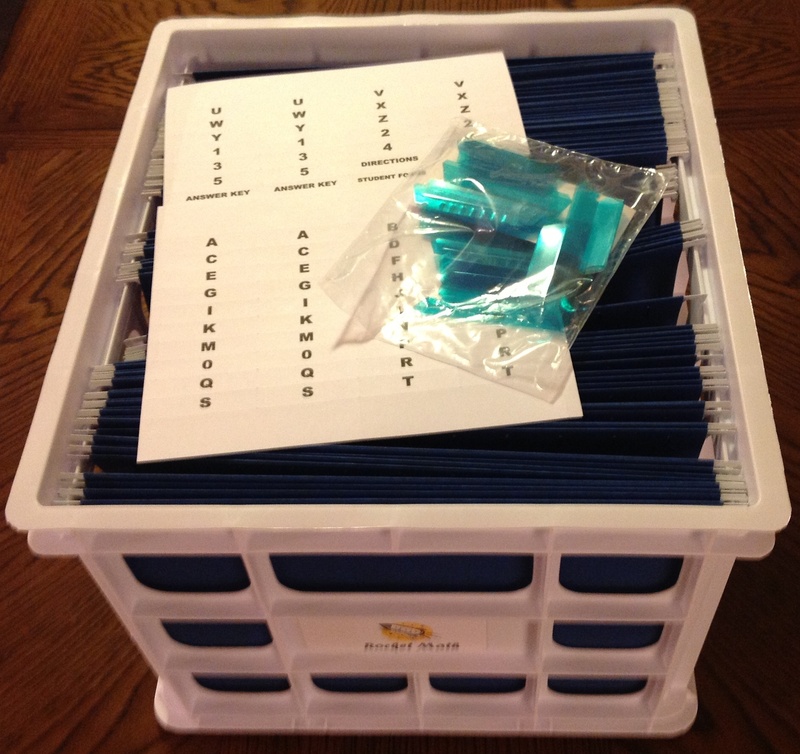 Print 20-30 copies of each of the Practice Pages A-Z and file those into the appropriately labeled hanging files in your crate. Copy a class set of these three sheets: (rocket chart), goal sheet and Individual student graph. 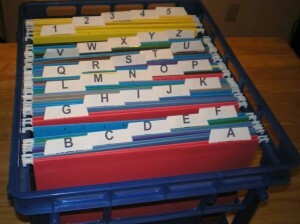 For each student create a folder with Rocket Chart on the front, and goal sheet and graph inside. First day give the “ (Writing Speed Test)” to all the students. 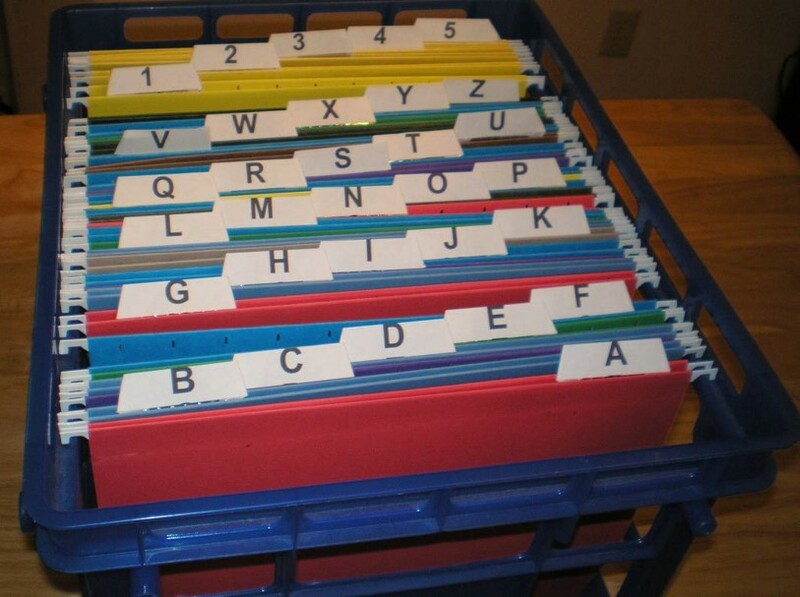 Take the number of boxes copied and take that information to the Goal Sheet stapled inside each student’s folder. 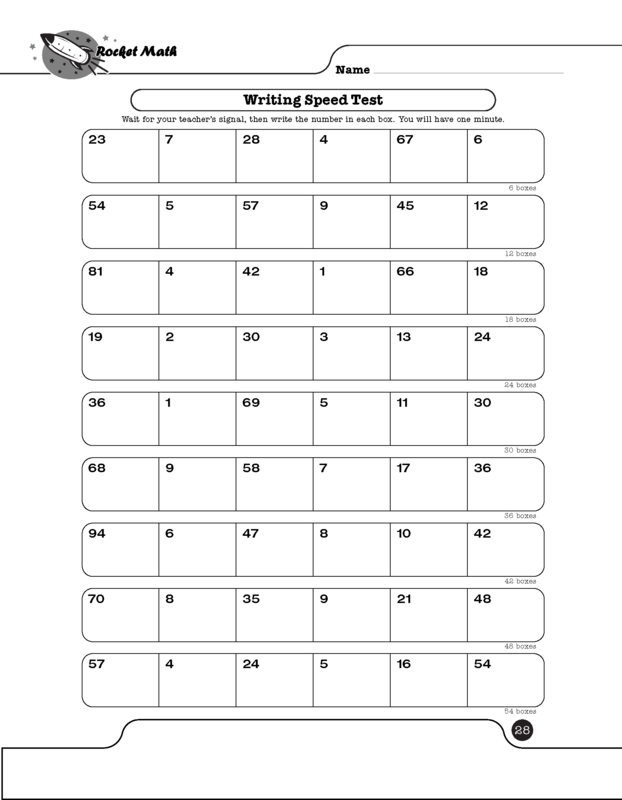 Circle the indicated row for each student based on the number of boxes they complete during the minute test. Next day do the four 15 second math placement probes for the operation in which your students are going to begin. (K-1—Addition, 2-3 Addition then Subtraction, Grades 4-6—Multiplication then Division). Read more about Math Fact Fluency Grade Level Recommendations. On the Rocket Chart on the front of the folder mark the letter in which each child should begin and fill their folder with six sheets of that letter. Model how to do paired practice by choosing individual students to be your checker while you do everything wrong (don’t say problems, hesitate before answering, get wrong answers). They demonstrate the correct way to correct. Do this modeling for five minutes or so each day for several days until every student can be the checker without flaw or prompting—and then a couple of days more—until they are begging you to begin. Find 10 minutes every day at the same time to do this. Read more and watch our online videos on ‘How Rocket Math Works’. Can students with special needs learn math facts? Question: We have purchased and are implementing your program at my school and LOVE it! Our staff wondered what tips/techniques you suggest for implementing the program to students with special needs? Rocket Math was designed to be effective as it is with students with special needs students–but only if it is done according to the directions. I have seen it used successfully in many special education classrooms, including my own and in my practicum student’s classrooms. All the details of how it should be used are especially critical for students with special needs. Some of the aspects are especially important. 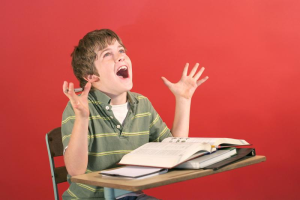 Here are 7 things that will really help students with special needs succeed in Rocket Math. One key with students with special needs is to monitor their writing speed carefully. One should be sure to give the writing speed test and make sure that they follow the time limits. It’s not unusual for these students to try to squeeze in a few more responses on timings after time is up, because they are used to not being able to perform as expected. Of course, if a student with special needs does that on the Writing Speed Test their goals would end up being impossible to meet. So be careful there. This may involve consultation between the special education and general education teachers so that goals don’t get too high causing lack of success. Writing speed is an issue for many students with special needs, and they often have great variation in how well they can perform from day to day. I would recommend caution about moving “up” the goals for these students. Perhaps you could wait until they have beaten their previous goal two or three days in a row, before raising the goal. You just want to be sure they can consistently write that quickly. It is important not to give lower goals to students with special needs, as they need to reach automaticity the same as everyone else. What will be different is the amount of practice they will need to achieve the goal. Where other students can develop automaticity with the four new facts in a couple of session a student with special needs might need ten or fifteen practice sessions. Rather than spread that practice out over two or three weeks, students with special needs should get more than one practice session (of two or three minutes duration) each day. Remember, don’t make sessions much longer than three minutes or students will burn out. I would encourage special education teachers to provide their students with an extra practice session each day in the special education room as well as the one the students have in their regular classroom. I would also encourage special ed staff to work with the parents (or siblings) to show them how to do another practice at home each evening. If the parents of students with special needs can be recruited and trained to provide extra practice at home–done positively—it can make a huge difference in the rate of learning. Three short sessions each day would enable a student with learning difficulties to be able to pass in five or six days—within the expectations for all the other students. Check on their partner–they need the best partners! It is very important that practice procedures for students with special needs be monitored and done exactly as written. It is hard to overemphasize the importance of the proper and complete correction procedure for these students. Besides teaching the parents or siblings how to do the practice, it might be valuable for special education staff to monitor how the practice sessions in class are going. Often students with special needs are not good at self-advocacy or leadership and if their in-class partners are not following the procedures the students with special needs will need help to correct the problem. Finally, we know that students with special needs have had a history of failure at academic tasks. Therefore they often lack perseverance and give up rather more easily than we’d like. This implies that students with special needs are more dependent upon the motivational procedures to keep them going. Unfortunately not all general education teachers make full use of Rocket Math’s built-in motivational procedures— such as coloring in the rocket chart, using the Rocket Math Wall Chart, or using the achievement awards. Students with special needs may need all of these things to keep them going and not giving up. The special education staff should work to provide some extra reinforcement if the homeroom teacher is not doing a lot. Even if there is no Wall Chart being used in the regular classroom, one could be put up in the special education room, and all the students on that teacher’s caseload could come in and put up star stickers as they pass levels in their regular classrooms. The special educator could set goals and have celebrations with his or her special needs students when the stickers pass the goal mark. In addition, a special education teacher can give out achievement awards to his or her students when earned, even if the general education students don’t normally get them in the classroom. One of the most important would be the “helper award” if the special needs student is getting practice at home. While none of these things involves modifying the directions for students with special needs, it is important to use ALL the tools provided in Rocket Math to ensure the success of students with special needs. The extra effort involved in using all of the tools carefully may need to be undertaken by special education staff to make sure it all happens. What if students become stuck? Something is wrong if any student cannot pass a sheet within the six tries shown on the Rocket Chart. Do not allow this condition to persist. Intervene with one of the ideas below. If the student has never passed a timing, perhaps the child can’t really write that fast. Try testing the student orally, with the student telling you the answers. In oral testing the student says only the answers—not the whole problem. If the student can orally answer at least 40 facts in one minute, then the student is satisfactorily fluent with those facts. The handwriting goals must be too high. Reset his/her goals at the previous best and let the student move on to the next set. The most frequent reason a student does not progress is because the student does not practice the right way. In other words he/she avoids saying the problems out loud or skips the correction procedure when they are hesitant. Or they will simply go on after a hesitation or error rather than going back three problems and trying again to see if they are faster now. 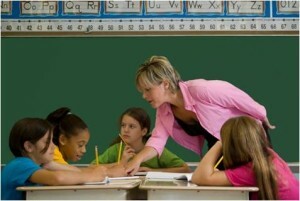 The remedy is for the teacher to practice with these students as recommended and see if that makes a difference. It often does. Let us tell you: This is typically the “magic bullet.” It is fascinating really. Carrying out the practice procedure as I have written it, is VERY powerful. I wouldn’t lie to you. If the teacher practicing with these students does help, arrange to see that they practice the right way consistently during peer practice. You may have to change partners or watch over them daily until they start practicing the right way. Consider increasing motivation through more rewards and recognition to keep students practicing the right way. The student may not be trying because he/she is unmotivated. Watch to see if the student is doing practice correctly or giving the test their best effort. Most often this is a result of failing to succeed rather than a cause. [That’s really a very important understanding for you to have, so I’m going to say it again!] Lack of student motivation is most often a result of failing to progress rather than a cause. Consider practicing with the student. Think about ways to increase student motivation, including use of student achievement awards and social recognition for success. Watch to see that the student is “on-task” throughout the timing. Some students fail to realize that looking up around the room during a timing will slow them down so much they won’t pass. [Really, I kid you not. I’ve seen kids, who stopped to check the clock several times during a one minute timing, be surprised that they didn’t pass!] If a student really cannot stay on task for 60 seconds you might try cutting the goal and the time in half—give a 30 second timing with a goal cut in half as well. That may do the trick. 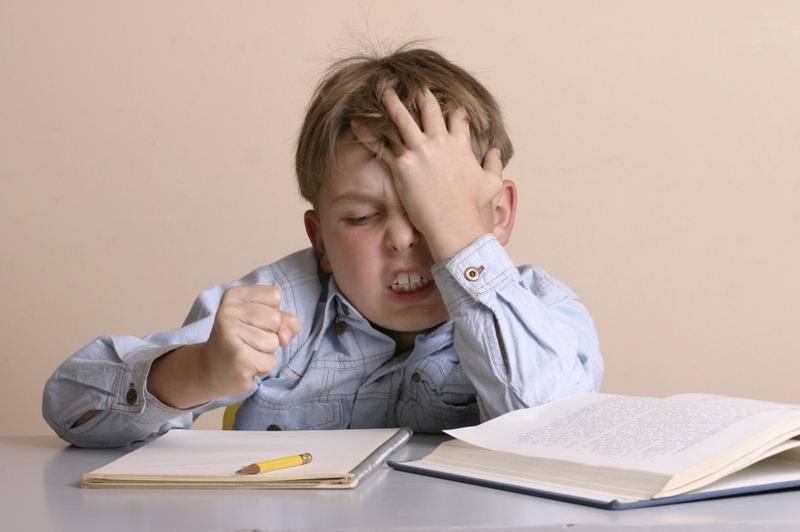 It is often necessary to point out to younger students that erasing takes too long. Have you ever watched a second grader erase something? One could grow old waiting. Point out to students that perhaps putting a line through a mistake and writing the correct answer would save time. If practicing with a student the right way doesn’t make a big difference, then the student may be stuck because he/she is “in over his/her head.” The student has officially passed several sets without completely mastering them. This should not happen if students always have to meet or beat their previous best—but sometimes it happens anyway. A sign that this has happened is that they have several facts in the set with which they are hesitant. You can tell just by watching over their shoulder as they complete a timing—there will be hesitation on several of the facts. The basic remedy for kids who are stuck is to back up in the alphabet until you find a letter they can pass. You can either test back all at once or have the student move back one letter a day until they do pass after one day’s practice. Get them a new Rocket Chart to start over. Once you find out where the student is successful, make sure their goals are as fast as they can write—that you’re not letting them pass even though they are hesitant on some facts. If you announce a policy of “six tries and then you have to move back” and you announce this policy ahead of time, fewer students will get to six tries without passing! Being proactive is the key here. It is important to cover all of your bases prior to bad things happening. It is much better to pre-correct for something than to have to go back and re-teach a procedure or try to introduce one when a student is upset and losing motivation. Warning (Yep, another warning. I am being proactive too! ): Do not reduce the criterion to pass each sheet, as that will make working through the sets in Rocket Math increasingly difficult for the students! They will not be learning each small set as well as they need to and you’ll be adding more facts faster than they can handle. The cumulative task will get more and more difficult. Only reduce the criterion if the student simply cannot write that fast—otherwise (with enough practice) they can learn all the facts to the same speed as they learned the first set. 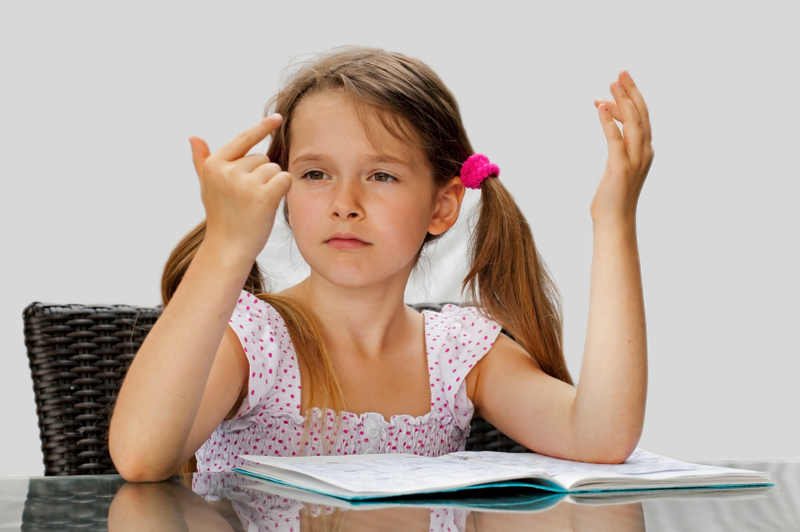 Why are basic math facts important to memorize? There are several reasons why learning math facts to fluency is a critical skill. Calculators expect users to have a ready knowledge of simple facts in order to know when errors entering data return incorrect answers. Lack of fluency with math facts limits the number of more advanced math problems students can and will do on a daily basis. Because doing math problems are so slow and difficult students resist doing their math assignments and thereby learn less. Students who are being distracted because their fact knowledge is not automatic find it difficult to learn complex math algorithms. Students who are automatic with their math facts find it much easier and are much more successful at higher level math. Once students reach fractions, they need to figure out common denominators, equivalent fractions, reduce fractions and cancel out like factors. All of these procedures depend upon instantaneous recognition of multiplication facts. Students cannot easily learn, nor easily understand fractions procedures without a ready knowledge of multiplication facts. Mastery of fractions, decimals, percentages and ratios is required for students to be ready for algebra. Algebra is the gatekeeper to all higher math classes and success on the SAT. Higher math is the gatekeeper to 4-year colleges and all of the more technical professions. For some students all of these opportunities are denied due to lack of mastery of multiplication math facts! We know, as teachers, that we can trace our students’ difficulties with higher order math algorithms to a lack of fluency with basic math facts. We also know that we need to do something about our students’ lack of fluency without sacrificing loads of time that needs to be spent on the core math program. What do we do you ask? Here is the answer! Rocket Math is a structured program for the sequential practice of math facts. The program is structured in a consistent manner (Let’s hear it for consistency!) through all four operations so teachers can implement a simple daily routine. (Simple is good!) The key uniqueness of the program is the slow introduction of new facts and the structure that will allow students to progress towards mastery at their own pace. This has proven to be a powerful ingredient in the success experienced by the students and appreciated by the teachers as students become fluent in math facts. This way of organizing math facts is both research-based and has had many years of on going field success. Allowing quick learners to master higher operations while students who require more time on an operation proceed at their own rate, builds confidence along with mastery. Each day’s routine takes no more than six or seven minutes of class time…Really, six or seven minutes! The program’s daily component consists of one page practice sheets lettered A-Z. The outside of each page gives practice focused on 2 facts and their inverses. (Only four new facts at a time you ask? Yep!) The inside is a timed test on the facts learned thus far. A timed test every day and YOU don’t have to create it! (Sounds good to us too!) Students who meet or beat their goal get “glory” and a new sheet to work on (with two new facts and their inverses of course). Students who do not pass, take home the test and practice and repeat the page again the next day. Same thing happens the following day: practice on the outside on the facts learned thus far, then take a timed test on the inside. Students record their efforts on a rocket chart on which they color in lettered squares for each sheet they pass. There are placement tests for accelerating students into an operation in which they already have some proficiency. There are tests of writing speed so that adjusted goals can be created for students who can’t write fast enough to answer 40 problems in a minute. Students with such adjusted goals are expected to always meet or beat their previous best to pass. How smart does this sound? Sounds smart to us too! Within each operation there are also five progress-monitoring tests (2-minute timings of ALL the facts). Every week or two students take these two-minute tests and graph the results on blank graph forms provided. This enables the teacher and students to keep track of their progress in memorizing these facts. These progress-monitoring tests are powerful tools for encouraging students as well as perfect data collection and management tools.